The new slimline XBox One S has hit stores around the country. Slimmer and sleeker. 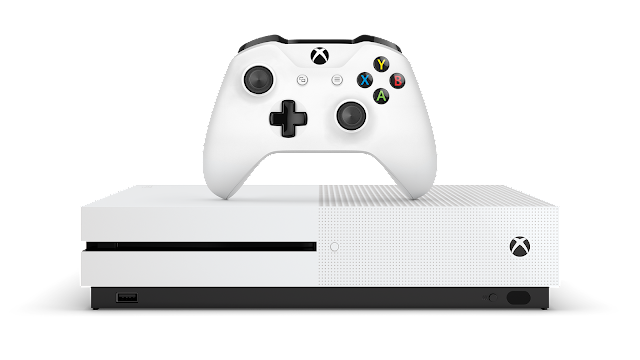 With a fresh new design built from the ground up and “robot white” color, the Xbox One S is 40 percent smaller than the original Xbox One, creating the most compact Xbox yet. It also includes a built-in power supply and, in response to fan requests worldwide, can be placed horizontally or vertically with an optional stand. With fans at the core of what we do, Xbox One S offers exceptional games and entertainment value. 4K Ultra HD media. With Xbox One S, you will be able to watch Blu-ray movies and stream video in stunning 4K Ultra HD. 4K content from Netflix is available starting 7/29 with the Xbox Update and content from partners like Amazon Video will be available shortly after launch. To review the 4K Ultra HD Blu-ray experience, please download the Ultra HD Blu-ray Player app from the Store. High Dynamic Range (HDR) support for video and gaming. With a higher contrast ratio between lights and darks, HDR brings out the true visual depth of your games and media so you can experience richer, more luminous colors as you play your favorite games like Gears of War 4, Forza Horizon 3 and Scalebound. Xbox One S supports HDR10 standards. Increased accessibility. We shifted one of the three USB ports and the pairing button to the front of the Xbox One S alongside the newly added IR blaster, allowing for better accessibility. New Xbox Wireless Controller. Every Xbox One S comes with a newly designed Xbox Wireless Controller featuring a sleek, streamlined design in white, textured grip for enhanced comfort and an updated thumbstick design that significantly reduces wear. An added Bluetooth radio gives you easy wireless connection to your Windows 10 PCs and tablets. The new controller features our most reliable wireless signal ever, with up to two times the wireless range compared to previous controllers when used with Xbox One S. You can also purchase as a standalone product for $99.95 NZD. Various hard drive options to fit your needs. With Xbox One S, you can choose the hard drive that’s right for you, with 500GB and 1TB consoles as well as the special launch edition of Xbox One S that lets you store more games with a 2TB hard drive. Xbox Summer Update. Starting July 30, Xbox One and the Xbox app will receive the first of two updates this year that will help you stay connected with friends on Xbox Live and enjoy even more games across your favorite devices. Cortana comes to Xbox One, as your digital gaming assistant, use Cortana to help you complete tasks while staying focused in the game; we’re updating the Game Collection interface to make it faster and easier to find and launch the games you’re looking for; Facebook Friend Finder is expanding from the Xbox app to Xbox One and is a great way to find and add your Facebook friends on Xbox; the Xbox and Windows Stores will start to become unified; in addition, the top PC games on Windows now show up in Xbox Live, complete with Game Hubs; and more. Xbox One S will also be available soon with 1TB and 500GB hard drives.